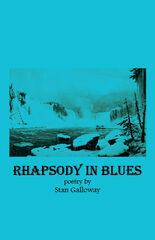 Stan Galloway teaches at Bridgewater College in Virginia’s Shenandoah Valley. His poetry includes Just Married (unbound CONTENT, 2013) and two chapbooks. His reviews of poetry have been published in such places as New Orleans Review and Paterson Literary Review. His book of literary criticism is The Teenage Tarzan (McFarland, 2010). He is founder and host of the Bridgewater International Poetry Festival.